Australia loves performance vehicles of every shape, size and colour – and the Jeep Grand Cherokee Trackhawk is pure performance packaged in a particularly peculiar form. So what makes this seemingly innocuous SUV such a powerhouse? We travelled to Portland, Maine, to find out for ourselves. 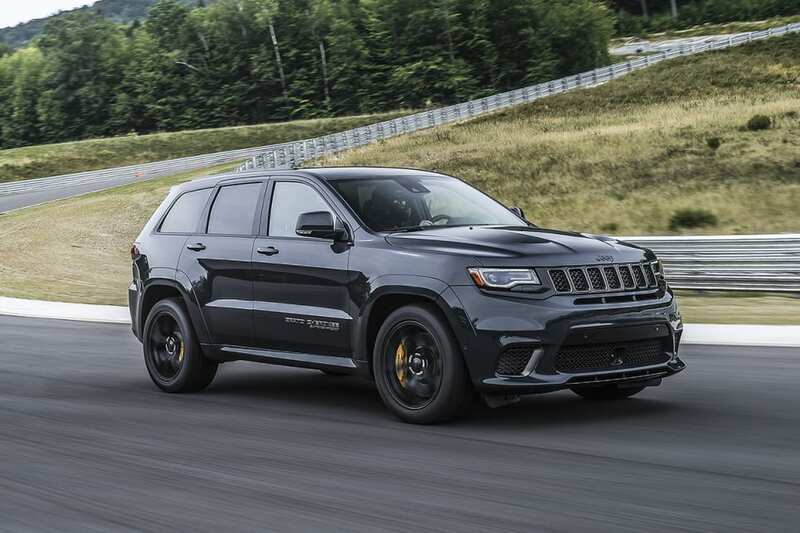 You’ll need to be a bit of a Jeep tragic to spot the changes between the SRT and Trackhawk, but they are there. 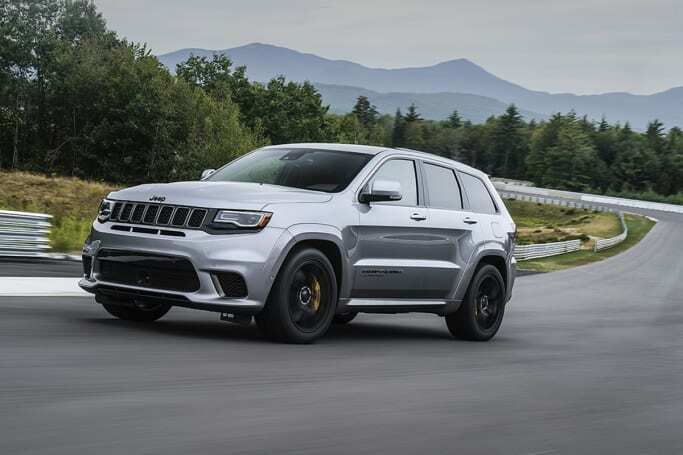 Based on the five-door, five-seat MY17 Grand Cherokee, the Trackhawk’s most obvious signatures are the yellow Brembo calipers – six-piston front and four-piston rear – and the unique black chrome quad exhaust pipe treatment. Speaking of the brakes, they dwarf even those used by Supercar race rigs, with 400mm front rotors and 350mm rears. A Supercar uses 395mm front rotors. The body-coloured wheel arch flares and bonnet vents are shared with the SRT, but the Trackhawk gets its own set of massive 20x10-inch rims fitted with 295/45 ZR20 Pirelli tyres. It’s homologated for both Scorpion Verde run-flat and P-Zeros, and word is the Australia will offer the latter, along with a carryover 20-inch black rim that’s slightly lighter than the stock item. The body-coloured wheel arch flares and bonnet vents are shared with the SRT, but the Trackhawk gets its own set of massive 20x10-inch rims fitted with 295/45 ZR20 Pirelli tyres. The Trackhawk's visual differences to an MY15 Grand Cherokee are the yellow Brembo calipers and the unique black chrome quad exhaust pipe. Its LED headlights also get a bespoke black treatment to set them apart. It’s a similarly low-key story inside, with the dark suede and leather interior spiced up with black chrome and carbon trim pieces, as well as Trackhawk logos on the seats and a 320km/h speedo on the digital dash. Red seatbelts and Trackhawk-specific front seats are likely to be optional extras, and standard on the Launch Edition. If you like 'em blocky and unpretentious, the Grand Cherokee is for you. The Grand Cherokee wants for very little in terms of creature comforts, thanks to its American origins. It has four cup holders front and rear, bottle holders in each door and a bevy of storage spaces around the cabin. The Trackhawk also scores heated front and rear seats, a pair of USB ports and air vents for rear seat passengers and LED lighting throughout. Based on the MY17 updated Grand Cherokee but to be designated an MY18, the Trackhawk also benefits from the swap to a more traditional T-bar shifter for its upgraded eight-speed automatic gearbox. It replaces the much maligned – and subsequently recalled – toggle-style electronic shifter that made it difficult to know whether Park was properly engaged. Cargo space increases to a voluminous and boxed-out 1554 litres with the seats dropped, via the handy cargo area levers. This usability mod doesn’t, unfortunately, extend to the awfully old-school foot-operated park brake that still compromises left-foot space and comfort. The optional leather seats we tried are broad yet well shaped and sufficiently firm to provide a high level of comfort on a longer drive. Ours had RCA-in and HDMI ports built right in to the side; we’re not sure the Aussie cars will come with that. The rears, too, are comfortable and supportive in equal measure, and adequately sized for three adults. The 60/40 split-fold rear seats are adjustable for vertical angle, which is great, and feature ISOFIX baby seat mounts for the outboard chairs. It’s quite a climb up into the rear, though, thanks to the Jeep's height. Equally, the 782-litre cargo area has a high lip to traverse while loading. Points for the automatic tailgate button being mounted on the C-pillar rather than the door surround because a person of… lesser stature, let’s say… would struggle to reach it otherwise when it's open. No seven-seat option exists for the Grand Cherokee, out of interest. Exact pricing for the Trackhawk won’t be unveiled until it goes on sale in Australia around October, but all signs are pointing to a recommended retail of around $140,000,. This is a fifty grand jump over the SRT, give or take, but for something with this much power and performance out of the box, it’s a freaking bargain. A Launch Edition version, limited to 62 cars, is expected to drop in at close to $164,000. The Trackhawk’s supercharged 6.2-litre Hemi V8 engine – known in Fiat Chrysler Automobiles (FCA) parlance as the Hellcat engine – produces a truly astronomical 522kW of power and an even more amazing 868Nm of torque, and will easily take the mantle of most powerful SUV in Australia when it launches. The Trackhawk will be, when it goes on sale in Australia later this year, the third most powerful car you can buy in Australia at any price. The Trackhawk will be, when it goes on sale in Australia later this year, the third most powerful car you can buy in Australia at any price – and you can buy about 14 of them for the combined price of the top two, the Ferrari F12 and the Lamborghini Aventador. And while Jeep claims it as the fastest and most powerful SUV in the world at 522kW and 3.7 seconds to 100km/h, Tesla fans may disagree… at least with the fastest bit, as the Tesla Model X P100d version can nip to 100km/h 2.8 seconds. Others will argue that the Tesla is more van than SUV, and there’s no doubt that it won’t be able to do anything like the same numbers time after time, or even get around a single lap of a track at speed. The monster engine is backed by a specially engineered all-wheel drive system and eight-speed automatic gearbox, uses airbag suspension and huge brakes, and is essentially designed not to go off-road, despite the Jeep badge on the nose. As for the rest of the Trackhawk, it takes most of its spec from its ‘milder’ sibling, the 324kW SRT, including leather and suede upholstery, carbon interior highlights, a 7.0-inch digital dash display and an updated 8.3-inch multimedia touchscreen with sat nav, Apple CarPlay and Android Auto, as well as auto lights and wipers, a powered tailgate, 20-inch rims, colour-coded wheel arch flares and the biggest brakes ever fitted to a Jeep product. On the inside, the trackhawk comes with leather and suede upholstery, carbon interior highlights, a 7.0-inch digital dash display and an updated 8.3-inch multimedia touchscreen with sat nav, Apple CarPlay and Android Auto. Add to that up to 65 driver aid and safety features – including trailer sway control and towing camera, adaptive cruise control, lane departure and blind spot warning and rear cross-traffic alert – and the Trackhawk starts to look like a bit of a bargain. Well it does when it’s compared to rivals like Mercedes-AMG’s 430kW/760Nm GLE63 S AMG, the 405kW/680Nm Range Rover Sport SVR, the 423kW/750Nm BMW X5 M and the 419kW/800Nm Porsche Cayenne Turbo S.
In terms of value for money... it's kind of unbeatable if you look at what you get. The smooth and tractable 6.2-litre supercharged V8 under the bonnet of the Trackhawk has been pinched from parent company FCA’s Dodge division, where it’s known as the Hellcat and is used in the Challenger and Charger. The big engine has been considerably reworked for the Jeep, with a new baffled oil sump, a milder camshaft, an additional cooling circuit and new air intake system added. The air is actually fed into the engine via a cold air duct mounted where the left foglight would be on an SRT, and helps to feed 30,000 litres of air per minute to the engine. Its supercharger is larger than most engines at 2.4 litres in capacity, and adds 11.6 psi of boost right through the rev range. The end result is 522kW at 6000rpm, with a redline of 6200rpm, while the maximum torque of 868Nm is made at 4000rpm. In Track mode, the Trackhawk sends up to 70 per cent of its pwer to the rears, while Normal equates to a 40/60 front rear split. The engine is almost 100kg heavier than the 6.2-litre in the ST, thanks to a stronger steel block and that extra cooling circuit, which helps to keep inlet temps to 60 degrees C no matter how hot it is outside. The drivetrain, too, is heavily tweaked, with a new, toughened version of ZF’s eight-speed auto linked to an all-new rear end assembly that’s been built to take the prodigious grunt. Shift times have been shortened, too, with Track mode shifts happening in just 150 milliseconds. In Track mode, the Trackhawk sends up to 70 per cent of its pwer to the rears, while Normal equates to a 40/60 front rear split. Its Towing mode can actually send 60 per cent of drive to the fronts, as well as activating trailer sway control and a rear view camera monitor. It can tow up to 2949kg of braked trailer, by the way. A lot, but not as much as you think. 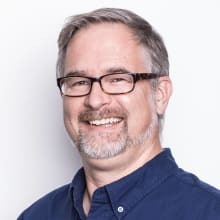 US figures suggest it'll return 12.1L/100km on a combined fuel economy cycle, and we actually posted 15.2 L/100km via the dashboard after a 280km commute across Portland, Maine. The big Jeep has a 93-litre fuel tank that can accept 91 RON. All bets are off at the track, though. The Trackhawk is less about how many bikes or bags you can put in the back, and much more about the truly amazing powerplant under the vented bonnet. From start-up, it makes its intentions clear, with a clear, sharp bark that will definitely alert the neighbours that you’re up, but it quickly settles down. It’s throaty and vocal on takeoff, but no noisier than a typical HSV or sporty Audi, for example. It’s what happens when you find a long (and we mean long) stretch of road that sets the Trackhawk apart from anything else you’ve ever experienced. Cracking the long-throw throttle to even just three-quarters of its travel unleashes a mind-bending, chest-binding, senses-assaulting tidal wave of shrill supercharger shriek, enraged exhaust bellow and relentless forward thrust that’s not unlike being inside a proper racing car, or maybe the world's gnarliest fun fair ride. It’s violent and exhilarating, but it’s controlled and corralled by the big Jeep’s mass, its permanent all-wheel-drive system and its sophisticated torque-splitting set-up that ensures all four tyres have their best chance of keeping you on the black stuff. 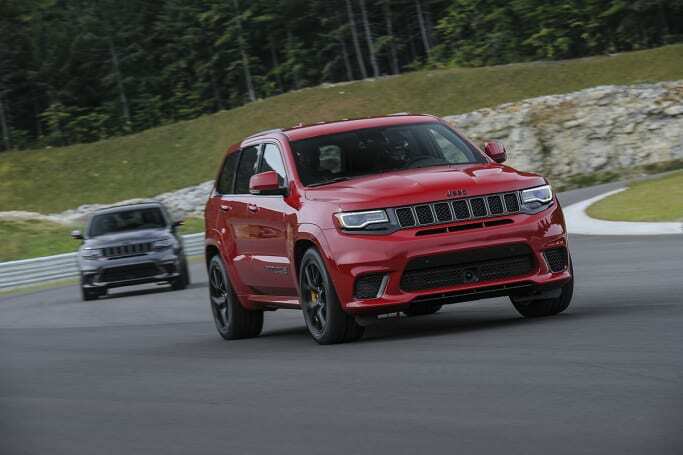 Rein the pace for the corners, and the big Trackhawk sits defiantly flat and roll-free, its bespoke Bilstein shocks, firmer springs and massive anti-roll bars working with the feelsome electric steering to give the Jeep serious cornering quality. Hit the track, and the sheer rate of relentless acceleration is such that it’s actually advisable to leave the gearbox in Sport Auto mode. Hit the track, and the sheer rate of relentless acceleration is such that it’s actually advisable to leave the gearbox in Sport Auto mode. Its calibration for trackwork is exceptional, with auto-blips on the downshift and the exact right gear awaits your throttle input at every corner exit. Head back out onto the open road, and while the Jeep feels a little bit taut and highly strung over broken tarmac, the exhaust noise all but disappears (it’s not a switchable system) and the eight-speed box selects a higher gear, and everything is calm and comfortable again. With great power usually comes great compromise when it comes to a car; if you ever drive a V8 that’s been modified to produce 522kW, it’ll be noisy, hot and generally cranky at civilian speeds. It’s incredibly impressive, then, that a car with so much power can be so easy to use. 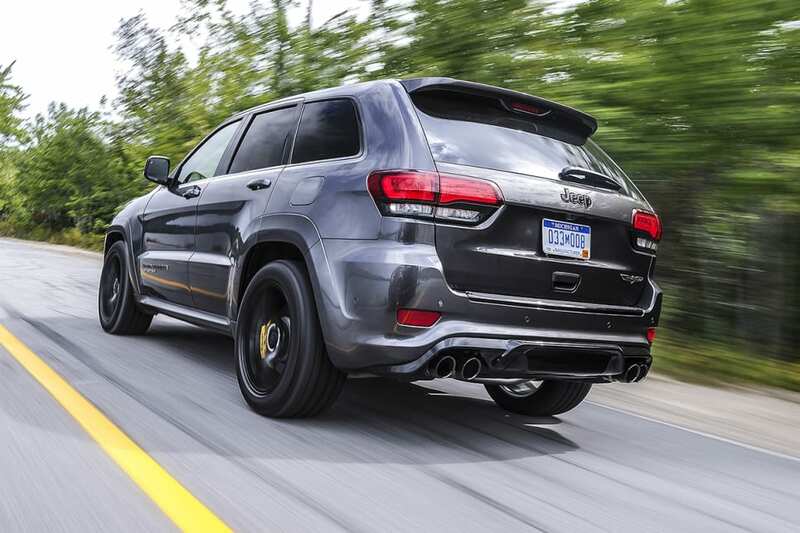 The Trackhawk is no more difficult to drive than any other Grand Cherokee. The Trackhawk is incredibly well equipped with active and passive safety equipment, including adaptive cruise control with stop function, advanced brake assist, blind-spot monitoring with rear cross path detection, full-speed forward collision warning with crash mitigation, front and rear park assist, lane departure warning and pre-crash braking. It’s also got trailer sway control as well the ability to view a trailer load at speed via a camera, as well as a valet mode. It holds a maximum five-star ANCAP safety rating, which was issued to the Grand Cherokee in 2011. Jeep is ramping up its warranty and service efforts on the back of a few years of lacklustre results in customer satisfaction surveys and a raft of technical recalls. It now offers a comprehensive five-year, unlimited kilometre warranty that can be transferred to private buyers for $99 if the car is sold, while lifetime roadside assist is also available for Grand Cherokees serviced through a Jeep dealer. Fixed price servicing costs isn't available yet for the Trackhawk, but the cost over the first five years for the 6.3-litre V8 SRT, by way of comparison, equals $3015, with service intervals set at 20,000km or 12 months. From the outside, it’s easy to sniff disdainfully at something like the Trackhawk as a throwback to another era. But in the real world, the Trackhawk is every bit as practical as a regular Grand Cherokee, and offers a level of pure performance for astonishingly little money. It’s not just a big engine dunked into the nose of the Jeep – it has been thoroughly engineered by a small, dedicated team of car nuts, and it works both at ten-tenths and two-tenths. Emissions regs will eventually claim the scalp of most V8s, and we doubt you’ll ever be able to buy 522kW off the shelf in such a usable, practical and exciting package ever again. Sure, it drinks like a fish when you’re up it for the rent, and it’s a large, heavy car that will cost more to run in consumables like tyres and brake pads. 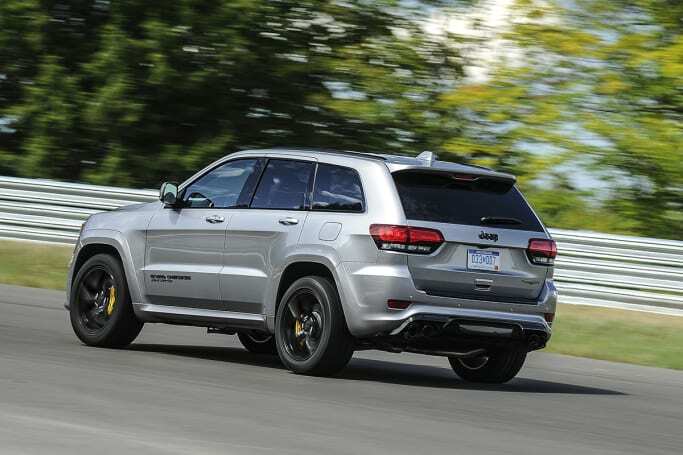 But the Grand Cherokee Trackhawk has an irresistible charm and personality that really appeals to those who love their cars, and it’s as accessible as a base model car for those who aren’t fussed about them. Aussies love their performance cars, and the Trackhawk is destined to become a cult classic. The Jeep Grand Cherokee Trackhawk... overblown indulgence or performance bargain of the century? 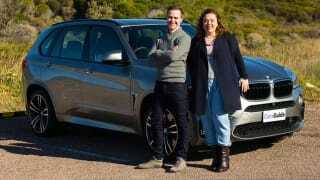 Nikki Cousins and Peter Anderson road test and review the BMW X5 M, with specs, fuel consumption and verdict. 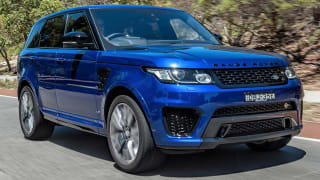 Paul Gover road tests and reviews the Range Rover Sport SVR with specs, fuel consumption and verdict.